I've been waiting for this record collection to appear on the Ancestry.com new collection list. And now we have it. 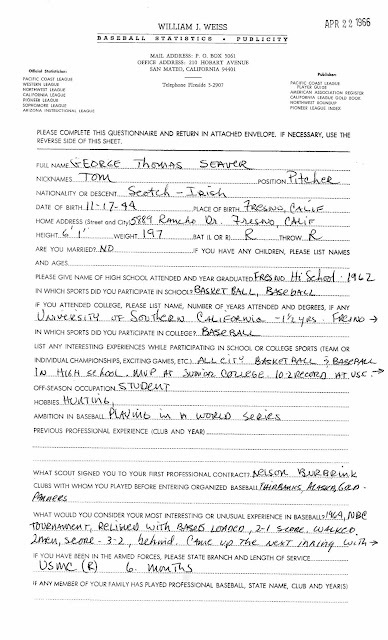 These are questionnaires filled out by baseball players, not necessarily major leaguers at the time, on a standard form created by William J. Weiss of San Mateo, California. 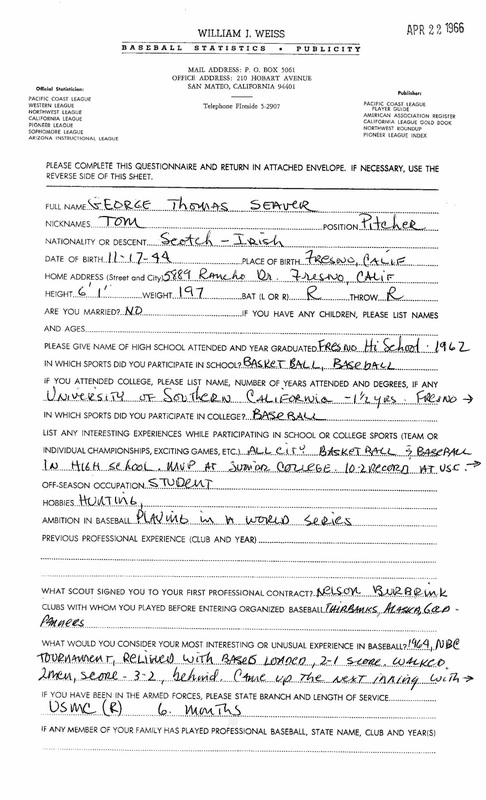 Cousin "Tom Terrific" filled this out in 1966, about the time he started playing professional baseball in the New York Mets system. There are 154,727 questionnaires in this record collection. As my devoted readers know, I am a big-time baseball fan. The season in San Diego starts on Thursday (tomorrow!) and even though my beloved San Diego Padres haven't been in the playoffs since 2006 and have been in only two World Series (1984 and 1998), hope still springs eternal today!! What a fun database! You can use the keyword search to find a player by nickname or high school. I found 6 graduates from my high school. You can also type in female names in the first & middle name search to find mothers, wives, and daughters. Thanks for the link!